Tiny House Homestead: Round and Round the Shouse We Go! I rolled up into Oklahoma early enough in the morning that I hit Oklahoma City just around 1 pm. Traffic was flowing nicely and I was able to really enjoy looking at the city as I went past. Driving out to my property was a breeze and the long dirt road took us over 4 very quaint little bridges. Each has a small sign posted that says how much weight it can support. We joked about guessing just how much all the crap in the truck combined with the car hauler may just be. We decided to cross the little bridges as quickly as we could safely go. I was so pleased to see that all the creeks and lakes actually have water in them! It is not the norm for me to see water and green plants after living in the desert for so long. I tried to watch for my property by checking mailboxes for addresses, but managed to drive past the entrance anyway. It is very well hidden by thick trees and grasses, combined with an entrance that has not had a car pass it in some time, and you would do the same as me. Fortunately, my neighbor was driving up to look for us and he told us to keep going down to his property so that we could turn around. I am leery of turning such a long vehicle and trailer around, so he volunteered to do it for me. Evidently he drove truck for a time and he made short work of it. What a blessing to have such good friends already! Finally arriving on the property, I was able to really get a good look at the old trailer I have been considering redoing. There is just no way this trailer is worth redoing. The slope alone told me it has huge issues, but the damage to the frame is bad as well. Disappointed, but not too worried, we emptied the car of everything we had stuffed in it into the old trailer and set off to explore and get some supper. I had some thinking to do about how I am going to build a house and I could not do that on an empty stomach! Arriving at the local brewery restaurant, I set about filling my belly and trying to decide if I just wanted to revert to the original Shouse plan or if I wanted to see about shopping for a used trailer. Munching on pretzel sticks and a cold beer, I decided to spend Monday exploring both options. For the time being I was going to eat and then head to Walmart for some supplies. That, my friends, is my new Shouse! I could not believe how neat this place is. We called immediately for info and was VERY excited by the price. This is no ordinary shed. 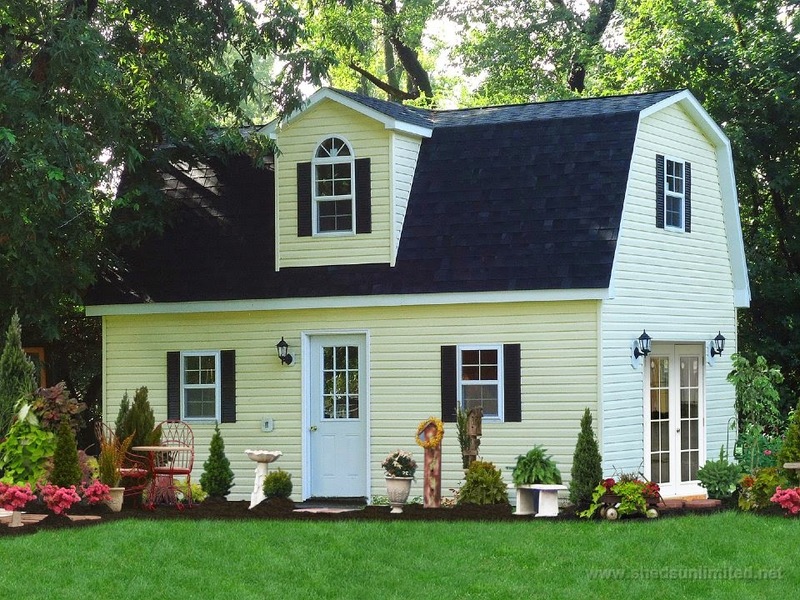 This is a Built-On-Your-Property-Can-Be-Built-On-A-Real-Foundation Shouse. It is the largest model that Heartland builds and I can add on to it without issues! I love that it is two story and so spacious. Other than building on a separate bathroom/laundry room, this Shouse is everything I need it to be! I have an appointment today at 11am to discuss all the final details, but this one is THE ONE. When all is said and done, this shouse with its bathroom addition will be approximately 786 sq. ft. of payment-free joy! Now to get on with the business of building!